Note: A minimum purchase of two tickets applies for Greater Union / Village / BCC / Event Cinema e-tickets. The two can be any combination of adult and/or child e-tickets. 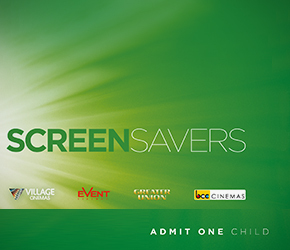 This e-ticket is valid for one child or senior admission and is to be surrendered at the cinema box office for a ticket to the session of your choice or redeemed online (Event Cinemas only). The e-ticket cannot be used for any movie sessions from 5.00pm onwards on Saturdays. E-tickets do not guarantee or reserve a seat - seating is subject to availability. E-tickets are not valid for Gold Class, group bookings, movie marathons, special events or in conjunction with any other offer or promotion unless otherwise stated. A surcharge applies for VMAX and 3D/Real D films. It is the responsibility of the holder to use this e-ticket before the displayed expiry date. Expired e-tickets will not be extended or replaced. E-tickets are not refundable and cannot be exchanged for cash. E-tickets cannot be sold or advertised without the prior written consent of Village Cinemas Australia.